The crew of the Nautilus can rest easy tonight, because there’s one less giant squid around to try to crack open the ship and eat the delicious people inside. For many years, the giant squid was thought to be fictional, like many other freaky fish. Due to its elusive nature, it’s very rare that one gets caught, either dead or alive. 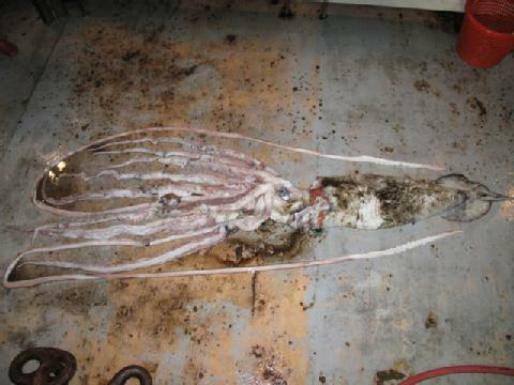 The last one caught in the Gulf of Mexico was found in 1954, and recently, a second giant squid was snared in a net 1500 feet below the surface of the ocean off New Orleans by a National Oceanic and Atmospheric Administration (NOAA) research vessel. To tell you how rare the giant squid is, they were first photographed in the wild in 2004, and only caught on video in 2006. The only known predator of this giant beast is the sperm whale. A full-grown giant squid can be anywhere from 33-43 feet long; the one caught in the Gulf was a puny 19.5 feet long and 103 pounds. There’s an even bigger version of the giant squid, known as the colossal squid, that can grow up to 46 feet in length.